Poisonous snakes and scorpions, ferocious cheetahs, graceful gazelles, and drought-adapted addaxes all call the Sahara home. The Sahara Desert is home to many unique, highly adapted species which lend life to the parched landscape. 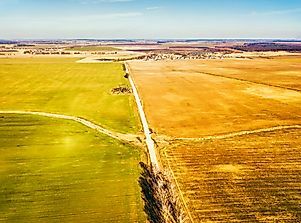 We usually tend to picturise the Sahara Desert as a vast, parched, lifeless stretch of sandy landscape with scattered nomadic tribes and their domesticated camels. However, there is much more to the Sahara than what we think. The Sahara Desert occupies an area of 9,400,000 square km, an area comparable to the size of the United States. It stretches across much of Northern Africa, covering about 31% of the African landmass. 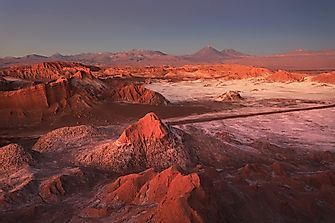 Thus, it is the largest hot desert in the world. The Sahara Desert hosts an incredible array of species that are well-adapted to survive in the desert climate. 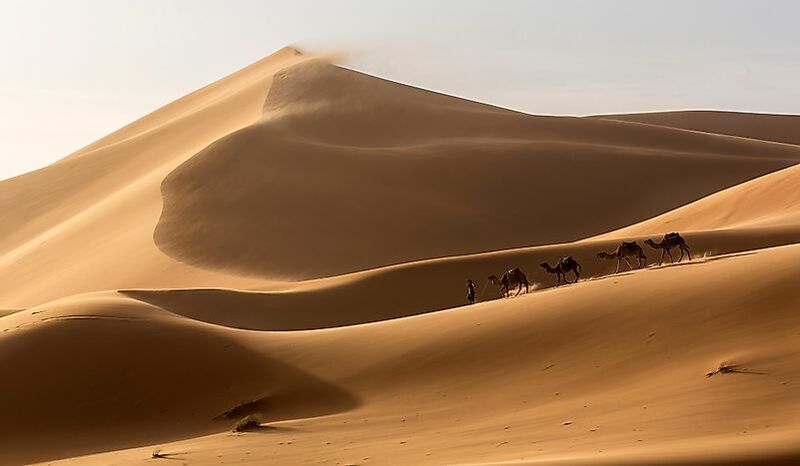 70 mammalian species, 90 avian species, 100 species of reptiles, and several species of spiders, scorpions, and other smaller forms of life, call the Sahara Desert their home. Apart from the dromedary camel and goats, the desert hosts the highly feared deathstalker scorpion, the extremely venomous sand viper, the elegant and fierce cheetah, the graceful gazelles, the swift-footed red-necked ostrich and more. Here, on our list of "What Animals Live In The Sahara Desert?" we present the unique species of the Sahara Desert. A unique animal, the Saharan Silver Ant (Cataglyphis bombycina), remains active for only 10 minutes a day. 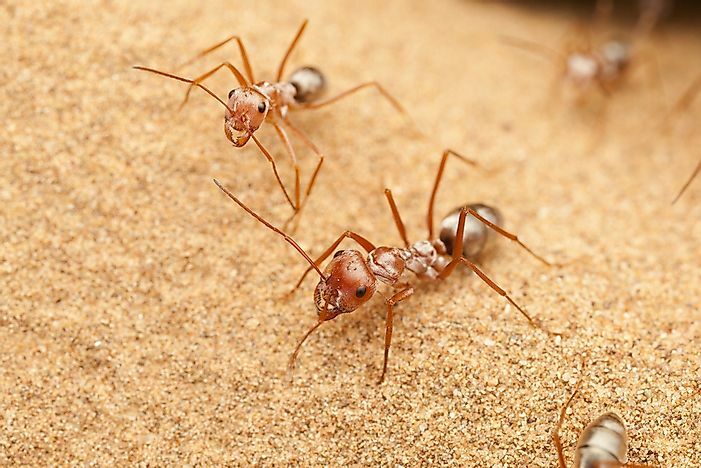 These creatures have longer legs than other ants and produce heat shock proteins before exiting their burrows. Both these adaptations help them survive the extreme heat of the desert. The deathstalker scorpion (Leiurus quinquestriatus) is the most poisonous scorpion species in the world. It produces a lethal cocktail of neurotoxins that might trigger excruciating pain in an adult human when bitten by this scorpion. Children, the aged, and the infirm individuals are also at risk of dying by envenomation in extreme cases of deathstalker bites. A deadly viper species, the Cerastes vipera inhabits the Sahara Desert. The snakes have a length of about 20-35 cm and possess a broad, triangular head and tiny eyes. The potent hemotoxin produced by this viper kills its prey almost immediately. Small mammals, birds, and lizards are the usual prey of these snakes. 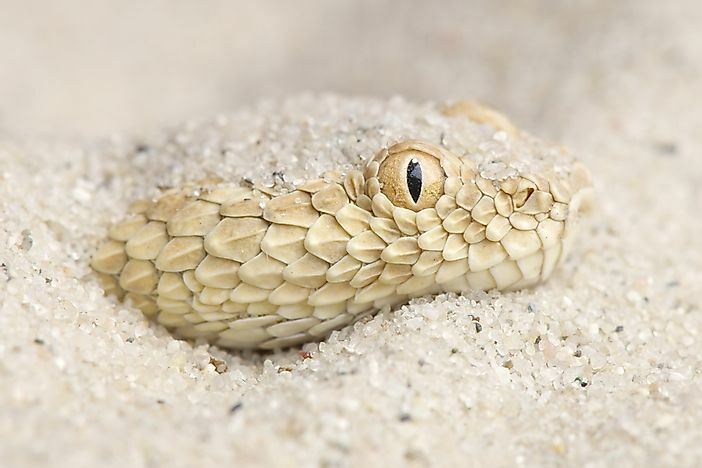 Another species of venomous viper, the Cerastes cerastes also live in the Sahara. The presence of a pair of supraocular "horns" helps to easily distinguish this viper species from others. When we speak of “What animals live in the Sahara Desert?” we hardly think of crocodiles. However, the West African crocodile (Crocodylus suchus) inhabits the desert habitat where it remains in a state of aestivation during periods of drought, hidden away in the safety of caves and burrows. During the rainy season, the crocodiles emerge from their shelter and gather at gueltas. The desert monitor (Varanus griseus) is a carnivorous lizard species found in the Sahara Desert habitat. 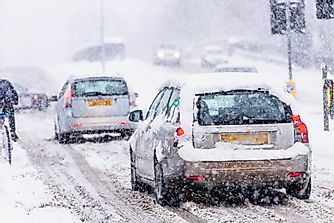 This animal is a cold-blooded creature and hence goes into hibernation from September to April. The lizards grow up to 1-2 meters in length and have an average lifetime of about eight years in the wild. The desert monitor feeds primarily on rodents, fish, and eggs but it might also feed on birds, small mammals, and other creatures if the opportunity arises. The black-faced firefinch (Lagonosticta larvata) is a common bird belonging to the estrildid finch family of Africa. This species can be sighted in many countries of sub-Saharan Africa. Currently, the bird is classified as Least Concern because of its widespread distribution. However, populations of this bird are estimated to be declining steadily. 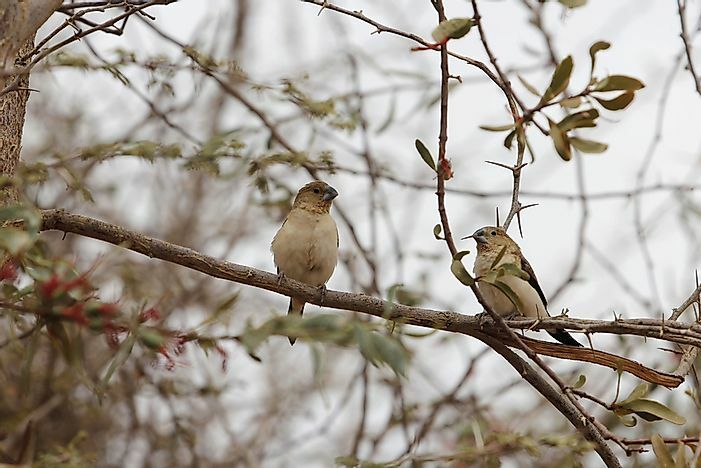 The African silverbill (Euodice cantans) is a bird that lives in arid landscapes. It is a resident bird of dry savanna regions of Africa bordering the Sahara Desert. The African silverbill is a sociable bird that perch atop trees in large flocks often huddled close together for long periods of time. They feed on grass seeds and seeds of growing plants. The North African ostrich (Struthio camelus camelus) is the largest living bird in the world. It grows up to about 9 feet in length, has a pinkish-red neck, black/white plumage in males and gray plumage in females. 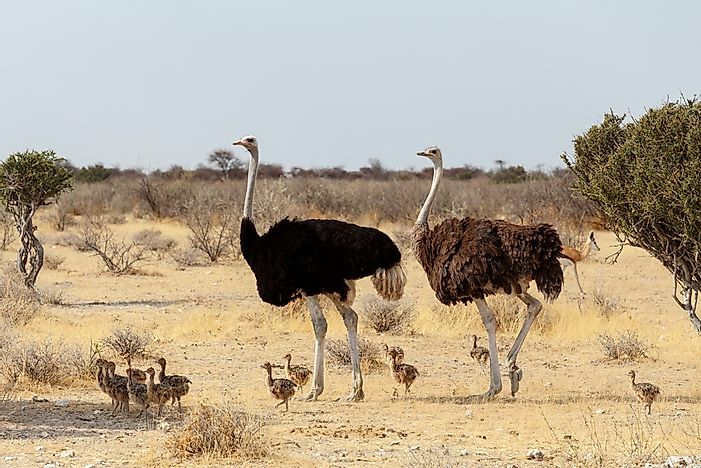 Hunting for food, capture for farming, loss of habitat, etc., has led to the rapid decline of the population of this ostrich. 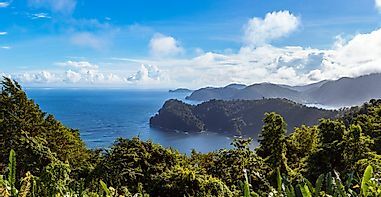 The species is now found in only 6 of the 18 countries where it once existed. 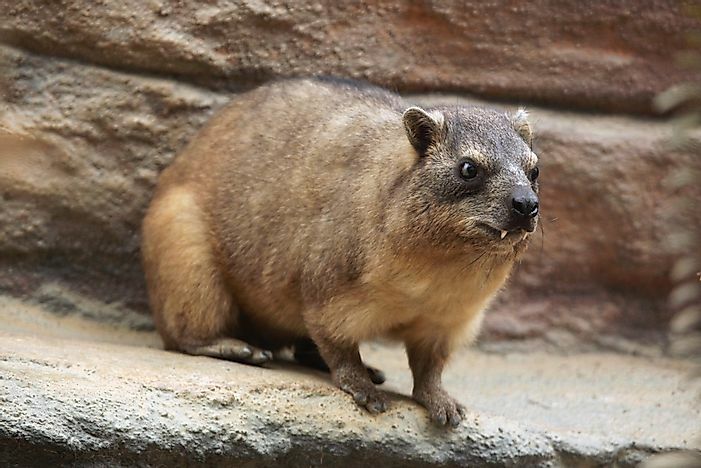 Small, thickset, herbivorous mammals, the rock hyrax (Procavia capensis) is found across sub-Saharan Africa. These animals usually take shelter inside rock crevices and come out at the time of foraging. They live in big groups of 10-80 animals and forage together. An endangered species, the African wild dog (Lycaon pictus) is native to sub-Saharan Africa. Today, only 39 subpopulations of this canid species exist comprised of 6,600 adults. 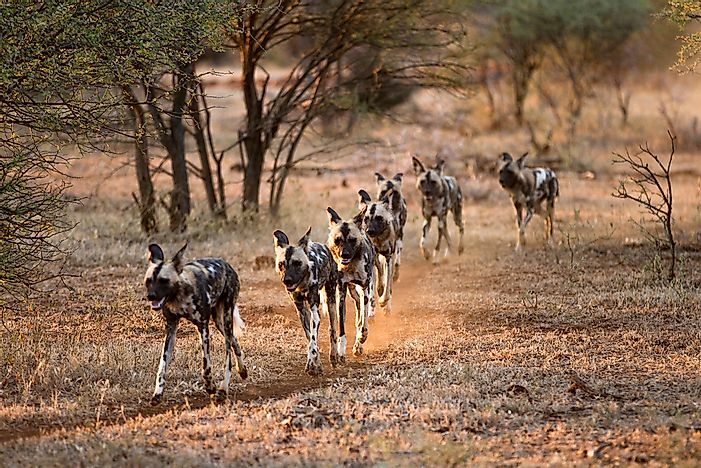 Outbreaks of infectious diseases, persecution by humans, and habitat destruction are responsible for the decline in African wild dog populations. These animals are highly social, living and hunting in large packs. Uniquely, it is the females of this species that leaves the pack when sexually mature instead of the males. Antelopes are their primary prey. The dorcas gazelle (Gazella dorcas), a small gazelle species, inhabits the Sahara Desert and surrounding grasslands. Designated as vulnerable by the IUCN, only 35,000-40,000 of these animals exist today. The dorcas gazelle is well-adapted to life in the desert. 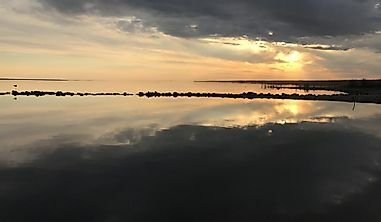 It can go without drinking for its entire lifetime, but when water is available, it does drink water. These gazelles are active between dusk to dawn when they forage for leaves, fruits, twigs, and flowers of desert vegetation. With fewer than 2,500 individuals of the rhim gazelle (Gazella leptoceros) left in the wild, this species has been declared to be endangered by IUCN. They are well adapted to survive the extremes of the desert habitat in which they live. These gazelles possess a pale coat color that reflects sunlight and enlarged hooves that allow them to walk smoothly in the desert sand. The critically endangered species of gazelle, the dama gazelle (Nanger dama) is today found only in Niger, Chad, and Mali though earlier it had a more widespread distribution. Hunting for meat and habitat loss threatens the survival of this species. These gazelles feed on leaves, fruits, grasses, and shoots of desert plants. 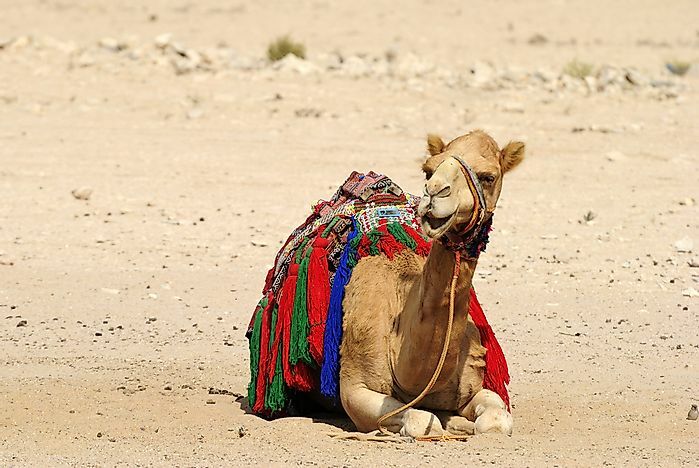 The dromedary camel or the Arabian camel (Camelus dromedarius), is the second largest camel species after the Bactrian camels. They have a single hump unlike the two humps of the Bactrian species. These camels have been domesticated by the human settlers of the Sahara and are utilized for various purposes like transport and meat. These camels are highly adapted to survive in arid conditions and are mainly nocturnal in nature. The people of the Sahara also keep domesticated goats for milk and meat. Both the camels and the goats were at one time found in the wild, but currently, wild populations of these animals are quite rare. The Fennec fox (Vulpes zerda) is the smallest canid species with unusually large ears that help dissipate heat. Its body is well adapted to the arid habitat, and it is found from Morocco through Egypt as well as down south till northern Niger and east till Kuwait and the Sinai Peninsula. It feeds on birds, insects, and rodents. 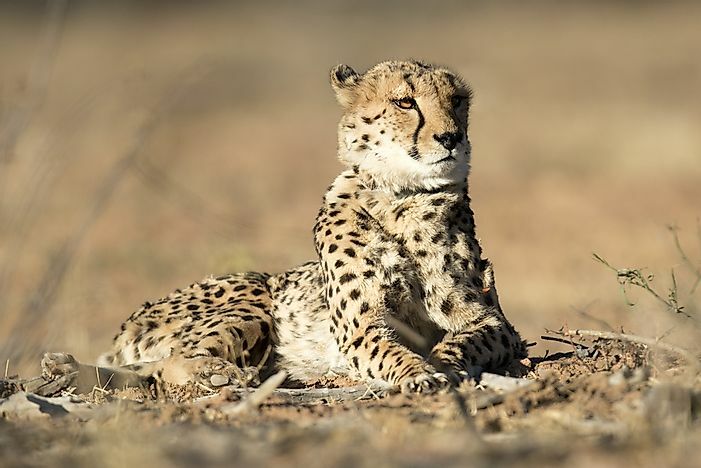 Among the top predatory animals that live in the Sahara Desert is the Saharan cheetah (Acinonyx jubatus hecki). Only about 250 mature adults of this critically endangered species survive today. 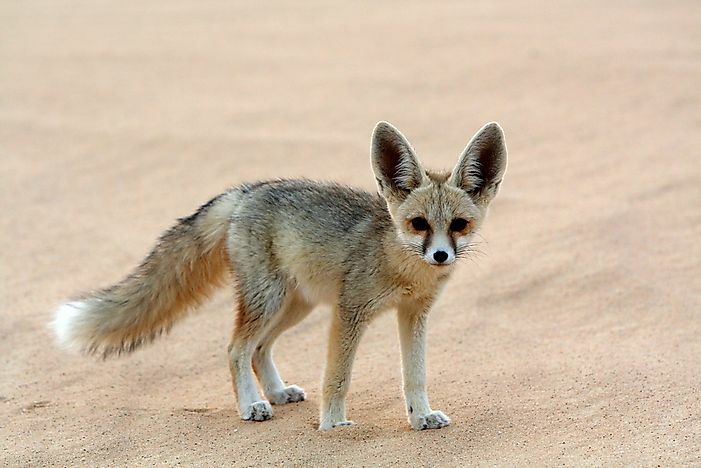 They are found primarily in the central western parts of the desert. These cheetahs have a pale colored coat and less visible spots and tear stripes than other African cheetahs. They feed on antelopes like the addax and the gazelles. Occasionally, they also hunt hares. They are usually solitary in nature with a semi-nomadic lifestyle. They mainly hunt at night. A critically endangered species, the addax antelope (Addax nasomaculatus) is rarely sighted in the Sahara. Indiscriminate hunting has wiped out large populations of this animal. The species is native to Mauritania, Chad, and Niger. It is characterized by its long, twisted horns and pale coat color which also lends it the name of white antelope. The addax antelopes are highly adapted to live in the harsh desert conditions and can sustain themselves without water for indefinite periods of time. Thus, they are found in extremely arid conditions, regions receiving less than 100 mm of annual rainfall. They feed on grasses and leaves of desert plants and obtain water from their food and dew. 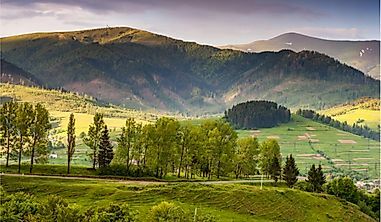 This page was last updated on August 10, 2018. What Is The Temperature In The Sahara Desert? What Animals Live In The Gobi Desert?